In this work, the effect of capping agent effects on the structural, morphological, optical properties and photocatalytic removal of Rhodamine B (RhB) dye has been investigated. TiO2 nanoparticles were synthesized by a simple, fast and eco-friendly sol–gel method, in the presence of various capping agents, including ethylenediamine, polyvinyl alcohol (PVA), ethylene glycol, glucose and valine. The obtained TiO2 nanoparticles have been characterized by X-ray diffraction (XRD), energy dispersive X-ray analysis, high resolution scanning electron microscopy and transmission electron microscopy, UV–visible absorption and photoluminescence (PL) spectroscopy. XRD pattern reveals the polycrystalline nature of TiO2 with anatase structure. The results revealed that the optical absorption band of TiO2 nanoparticles varied by capping agents. PL spectra exhibited visible emissions due to the formation of defects in the band gap region of TiO2 nanoparticles. 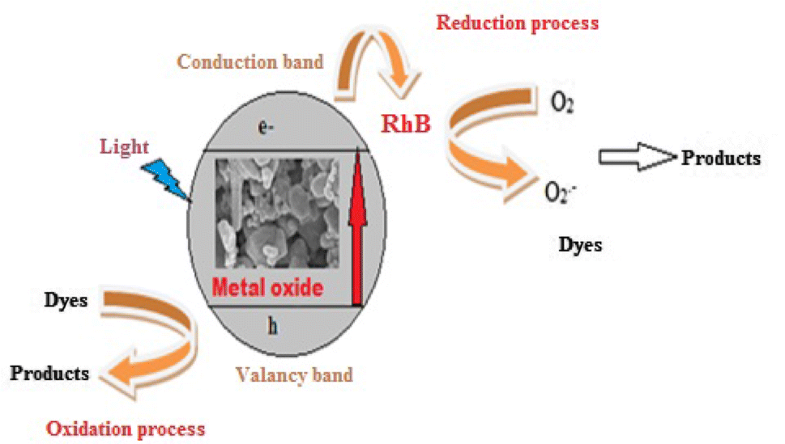 The photocatalytic degradation of RhB dye by synthesized TiO2 nanoparticles using different capping agents was investigated under UV irradiation and the results demonstrated that TiO2 nanoparticles have appreciable photocatalytic activity for decomposing RhB dye when PVA was used as a capping agent. The results explained that the preparation of TiO2 nanoparticles showed a high efficiency in the removal of organic dyes. 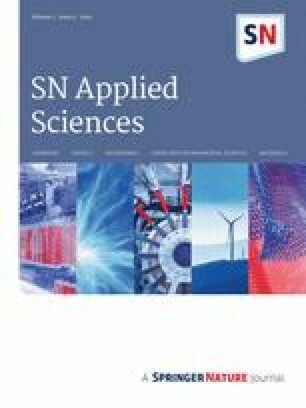 Transparent semiconducting metal oxide with high quality crystalline shape and size have much attention among the researchers due to their unique physical and chemical properties . They were utilized in numerous important industrial applications such as temperature sensor, solar energy conversion, gas sensor, photocatalysis and electrochemistry etc., due to their structural stability and properties are very different to those of bulk counterparts [2, 3, 4, 5]. Transition metal oxides are well known photocatalysts owing to their ability to generate hole-electron pairs . Titanium dioxide (TiO2) is one of the most extensively studied materials due to its thermal stability and harmless nature. It is multi-functional, cheap abundant and low cast materials. TiO2 is a n-type semiconductor  that can be formed in three different polymorphs rutile, brookite and antase [8, 9]. This different polymorphs exhibits different bandgap energies with 3.0 eV (rutile), 3.2 eV (anatase) and ≈ 3.2 eV (brookite) . Various methods have been employed to synthesize metal oxide nanoparticles, such as microwave method , hydrothermal method , solid-state , solution route method , sol–gel method . Among these methods, the sol–gel method has low a temperature for crystallization resulting in large crystalline size and small surface area. Although, the final product would contain high carbon content when organic reagents are used during the process. The solvents used for sol–gel preparation method can be classified into aqueous or organic methods. In organic method solvents like, ethanol, methanol or ethylene glycol is widely used as solvents for metal oxide preparation [15, 16, 17]. However, these organic solvents are costly, inflammable and dangerous to the environment. 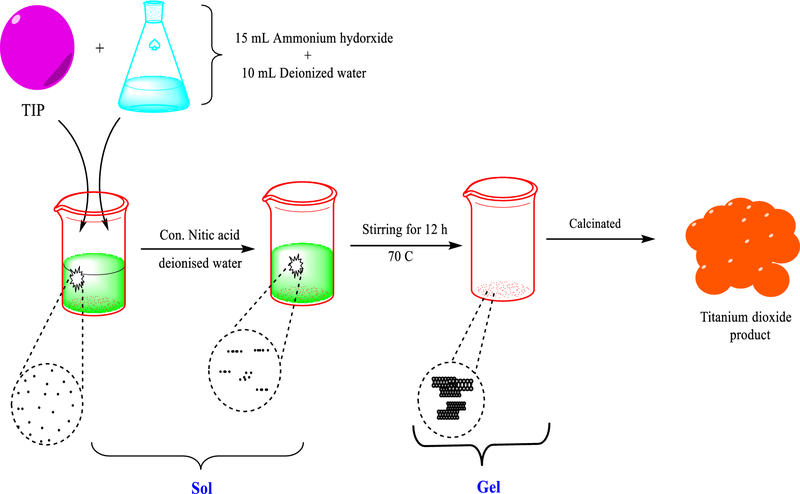 In aqueous method, DI (deionized) water can be used as a solvent to from more stable, uniform and eco-friendly solution that is easy to prepare metal oxide nanoparticles . Hydrothermal and precipitation methods have been used to synthesize semiconductor metal oxides directly from solution, which resulted in the formation of a various range of particle size powder. This process is the most well-known method for the production of various metal oxides. Even if this process is able to synthesize crystals of substances which are unstable near the melting point, and the ability to synthesize large crystals of high quality. Up to date, various surface modifications of metal oxides has been investigated by various capping agents, such as triethanolamine , trioctylphosphine oxide , triethanolamine , gelatin , l-cysteine . Functionalizing of TMOS surface by chemical agents can alter particle size, morphology, thermodynamic stability, optical properties, photocatalytic activity as well as antibacterial activity. Various types of the photocatalyst can inhibit the quick recombination of electron–hole pairs the through different mechanism [24, 25]. Among all, organic capped metal oxide semiconductor photocatalyst, more efficiently involved in the suppression of electron–hole recombination via Schottky barriers to the Fermi energy of the selected metals usually being lower than that of the semiconductors. Cozzoli et al. synthesized TiO2 in the presence of organic capping agents and compared the photocatalytic behavior by using Uniblue A as a pollutant. The results indicated that the photocatalytic effect was higher in the sample with both anatase and rutile structure. This is due to transfer of electrons from the anatase phase to the rutile phase which reduced the excitons recombination. In the present work, the photocatalytic performance of five samples of TiO2 nanoparticles was investigated by the photocatalytic degradation of RhB under UV–visible lighting. 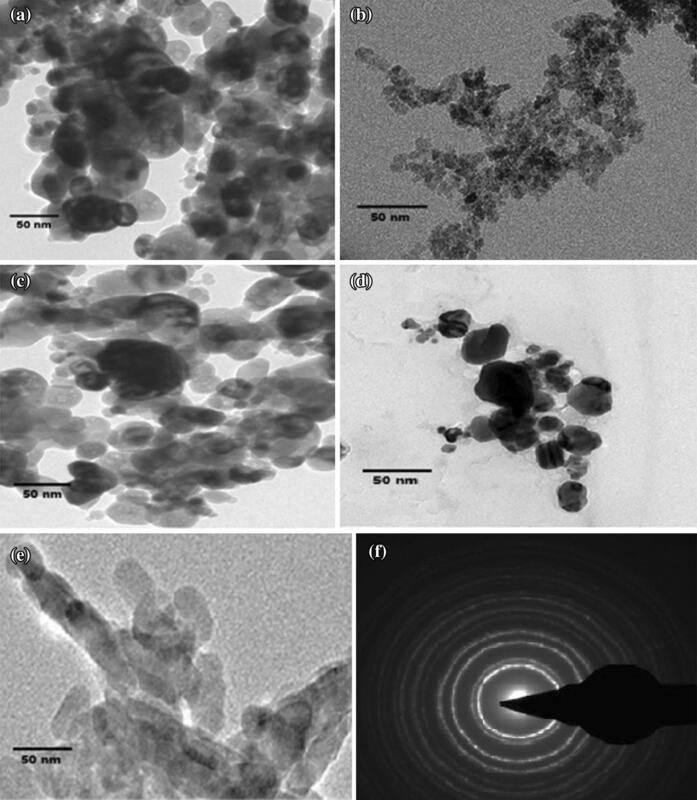 The structure, morphology, optical and photocatalytic activity of synthesized TiO2 nanoparticles were investigated in detail. Titanium isopropoxide (TIP) (Ti (OCH))(CH3)2)4) were used as precursors in the sol–gel process represented in Fig. 1. A 20 mL of solution titanium isopropoxide was added dropwise into the 25 mL of solution containing 15 mL of ammonium hydroxide and 10 mL of deionized water under constant stirring at 70 °C to form oxide network. Intended capping agents, i.e. ethylenediamine (EDA), PVA, EG, glucose and valine required concentration was added and stirring a continued for proper mixing of the capping agent in the mixed TIP and ammonium hydroxide. After an hour concentrated nitric acid mixed with deionized water was added into the titanium isopropoxide solution and keep it under constant stirring at 70 °C for 12 h highly viscous white sol–gel was obtained. The synthesized sol–gel was calcined for 2 h in a furnace at 500 °C for 1 h. Synthesis TiO2 nanoparticles via sol–gel method is usually prepared by the reaction of hydrolysis and condensation of titanium alkoxide (TIP or Ti(OR)n) to form titanium hydroxide. In addition to alcohol, acid or base also helps hydrolysis of the precursor, which is transformed into titanium oxide network. The X-ray diffraction (XRD) patterns of the sample were measured by using Philips X’pert PRO X-ray Diffractometer (PW3040/60) with CuKα radiation (45 kV, 40 mA). XRD patterns for the samples, examine were recorded in the region of 2 (= 10°–80°. The surface morphology and the size of the sample were characterized by (FESEM) Leica Cambridge S3600 and transmission electron microscopes (TEM) were taken with Philips CM12. The UV–visible optical absorption study was carried out using UV–visible spectrophotometer (Varian, Carry-50 Bio) in the wavelength range from 250 to 600 nm using quartz cuvette at room temperature. The excitation and photoluminescence (PL) spectra of the sample were measured by Perkin Elmer LS-45 luminescence spectrometer. To investigate the photocatalytic activity of the synthesized samples, degradation of RhB was performed under UV light irradiation at room temperature. A Hg lamp (UV) metal halide lamp with a 420 nm cutoff fleeter was used as the light source. An aqueous solution of RhB (100 mL 10 ppm) was prepared in a container and then 100 mg of the photocatalyst was dispersed in this solution. Before the irradiation, the catalyst/dye solution was kept in dark condition with constant magnetic stirring for 1 h to reach complete adsorption- desorption equilibrium. pH of the catalyst/dye solution was not adjusted. After 30 min intervals, 5 mL of the solution was taken and centrifuged to remove the photocatalyst particles before the photocatalytic experiment. The photo-reacted the solutions of the centrifuged sample were analyzed by measuring the change in absorption band maximum using the UV–visible spectrophotometer. After each photocatalytic reaction, the same materials were being centrifuged and dried to recycle for another test. 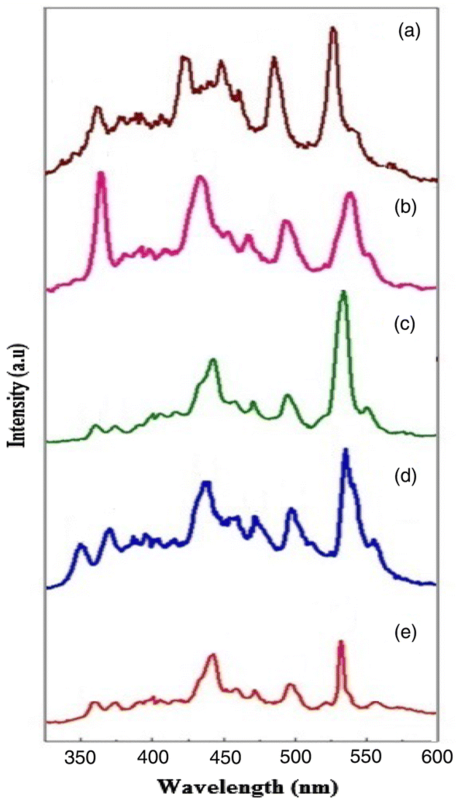 Powder XRD analysis was employed to characterize phase purity and the crystal structure of the synthesized photocatalyst TiO2 samples shown in Fig. 2a–e [sample a (Glucose capped), sample b (Valine capped), sample c (EDA capped), sample d (EG capped), sample e (PVA capped) TiO2 nanoparticles]. X-ray diffraction peaks of TiO2 crystal appeared which could be easily indexed anatase TiO2 (JCPDS file No. 86-1157) at 2θ angles of 24.14°, 35.36°, 35.56°, 35.73°, 47.52°, 54.79°, 55.21°, 61.36° are from (110), (103), (004), (112), (220), (105), (211), (204) planes. 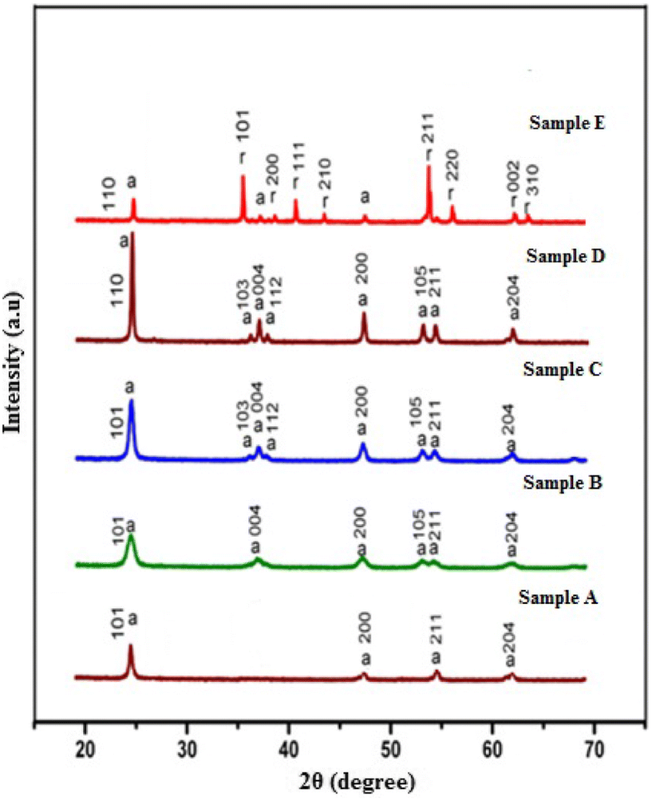 The intense and sharp peaks show that the sample is highly crystallinity and no other impurity peaks were detected in the XRD pattern of synthesized TiO2 nanoparticles with capping agents, i.e. EDA, PVA, EG, glucose and valine, denote that the synthesized photocatalyst purity. The crystallite size of TiO2 nanoparticles was calculated by Scherrer’s formula 0.9λ/βcosθ  shown in Table 1. Where λ is wavelength, of X-rays (1.540 for CuKα), β is the full width at half maximum, θ is the Bragg’s angle. 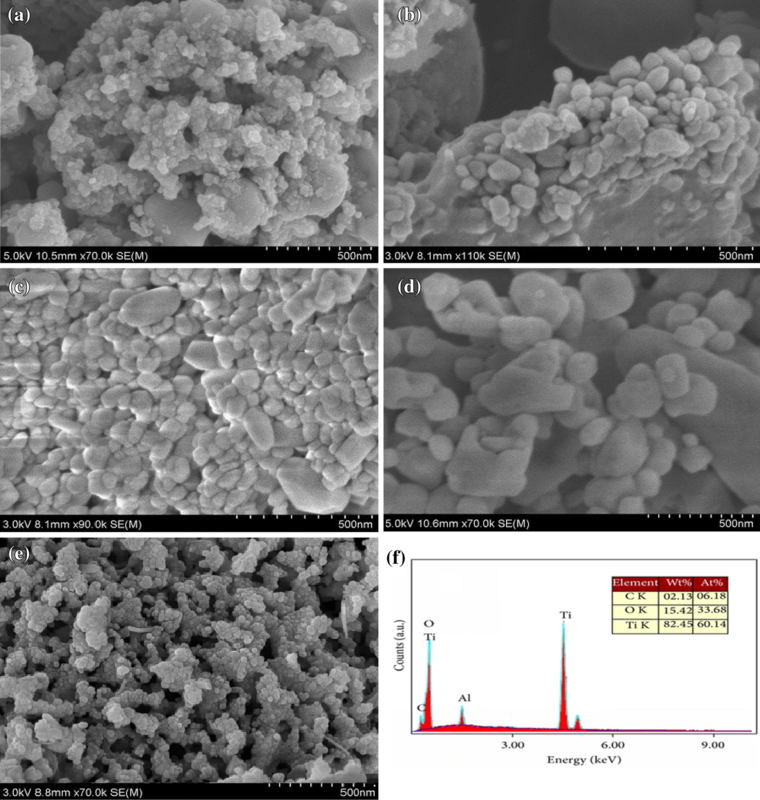 The representative morphology of synthesized measoporous TiO2 nanoparticles synthesized by sol–gel method was initially examined by FESEM. It is evident that the powder is more spherical like with various sizes. Although the particle sizes are reduced agglomerated, the grain boundaries between the crystallites are observable in synthesized samples. FESEM images of TiO2 nanoparticles catalyst with added capping agents glucose and valine shown in Fig. 3a, b, which validate the nanoparticles presence of loosely agglomerate and disordered arrangement with the irregularity of gap among them. Reduced agglomerations of samples increase the available surface area on the sample and gradually increase the efficiency of the photocatalyst . Figure 3c, d showed the very small fine particles of the samples with added capping agents EDA and EG. Figure 3e shows the mixture of nanoparticles with nanorods of TiO2 nanoparticles was capped with PVA. However, TiO2 nanoparticles with a surface modifier of PVA are higher particles form heavier particles and less agglomeration has occurred. The particle size appears to be stacked up to build due to the presence of oxygen vacancy at the synthesized sample with the higher surface to volume ratio [29, 30]. Elemental analysis of the synthesized sample was observed in the EDS spectrum. According to the Fig. 3f energy dispersive X-ray analysis (EDX) spectrum confirms the composition of the PVA capped TiO2 and the absence of any impurities in the prepared sample. In the TEM images of the synthesized TiO2 nanoparticle with a surface modifying agents include EDA, PVA, EG, glucose, and valine were conducted to discuss its particles nanorange and a spherical morphology shown in Fig. 4a–e. Figure 4a–d shows the presence of irregular spherical particles with sizes in the range of nanoparticles. Figure 4e which show the formation of nanorods, it depicted the irregular shape with good crystallinity with high accumulation which is contain nanoparticles with a diameter around 14 nm, which is consisted with XRD data and the selected area diffraction (SAED) pattern of TiO2 sample has high crystallinity, nanosphere can be observed from Fig. 4f. The SAED pattern shown the crystalline structure of the synthesized sample and that the nanoparticles does not consist of single crystals, instead of aggregates of several single crystals. The photoluminescence spectra are useful to disclose the efficiency of immigration, charge carrier trapping, and transfer and to understand the fate of electron–hole pairs in metal oxide nanoparticles since photoluminescence emission results from the recombination of free carriers [29, 30]. The correlation between morphology, size, and defect is investigated by photoluminescence spectra at room temperature. In Fig. 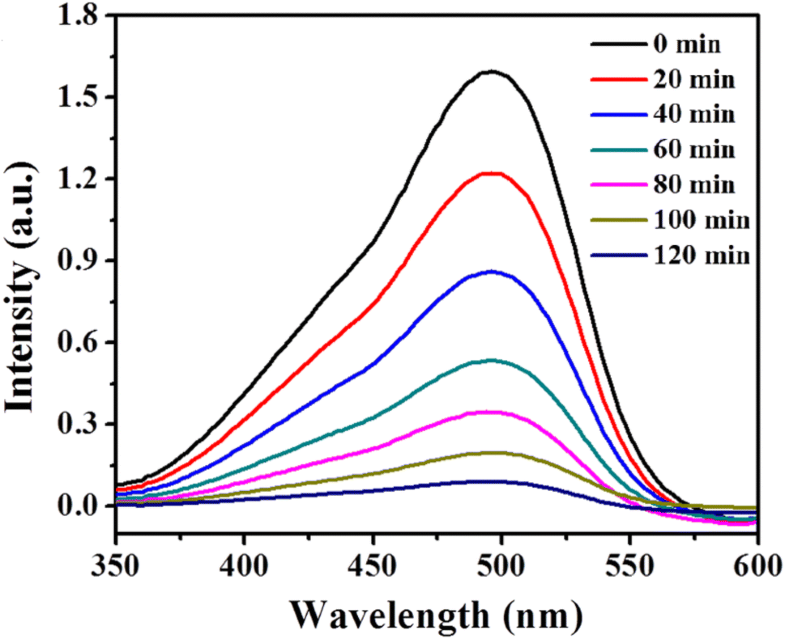 5 shown typical room temperature photoluminescence spectra of measporous TiO2 nanoparticle with the excitation wavelength of 350 nm. The PL spectra peaks observed between 350 and 550 nm for all samples are due to inter-band gap defects like oxygen vacancies . The PL intensity peaks around 389 nm associated with near band gap ultraviolet emission. The PL emission is observed at 438, 485 (blue emission), 510 and 527 (green emission) at room temperature. The strong peak at 485 nm corresponding to the blue emission, due to electron transitions intermediary by the vacancy levels in the band gap and oxygen defects [32, 33] formed during sample annealing at high temperature. The sample annealed at high-temperature structural defects, which generally act as the deep defect donors in semiconductor metal oxide that pitch into the optical emissions. The weak emission peak observed at 510 nm and 527 nm in green emission arises from a deeper level or trap course, emission is a particular ionized oxygen site with recombination of the photo-generated hole [34, 35]. The photoluminescence emission peak with a decreasing luminescence peak decrease in the particle size and increase in luminescence peak indicated is an increase in crystal size describe defects on the sample surface and consequently enhance the recombination process. The band gap energy of the sol–gel synthesized of TiO2 are shown in Fig. 6. Absorption energy is around 316 nm, 390 nm, 420 nm, 460 nm and 478 nm for respective glucose, valine, EDA, EG and PVA. An absorption edge position of EDA, EG and PVA capped TiO2 photocatalyst shown towards longer wavelengths are compared to glucose and valine capped TiO2 photocatalyst shifted towards lower wavelength. It can be undoubtedly attributed to the surface modifying agents, the absorption edge positions shift heading towards longer wavelength. The optical band gaps (Eg) of all the five samples were calculated by (αhv)1/2 versus hv, where α,h and v are the absorption coefficient, Plank’s constant and photo frequency respectively . 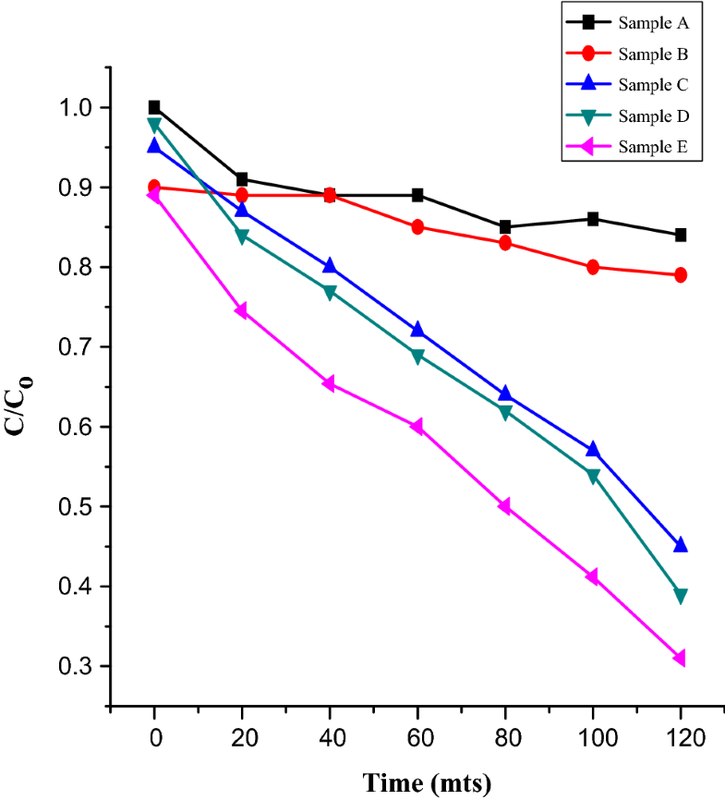 The band gap energy of measporous TiO2 nanoparticles shown in Table 1, which indicate that the TiO2 nanoparticle capped with PVA band gap of 3.10 eV due to decreasing particle size on the increasing crystallinity of the sample. These results showed that the band gap energy of PVA capped TiO2 nanoparticle by a sol–gel method using the TIP had shifted to a lower energy value. This decrease in the band gap may be associated with the increase in oxygen content due to the low heat treatment . To study the photocatalytic activity of the synthesized TiO2 photocatalyst, an experiment was carried out using an RhB solution as the probe material. 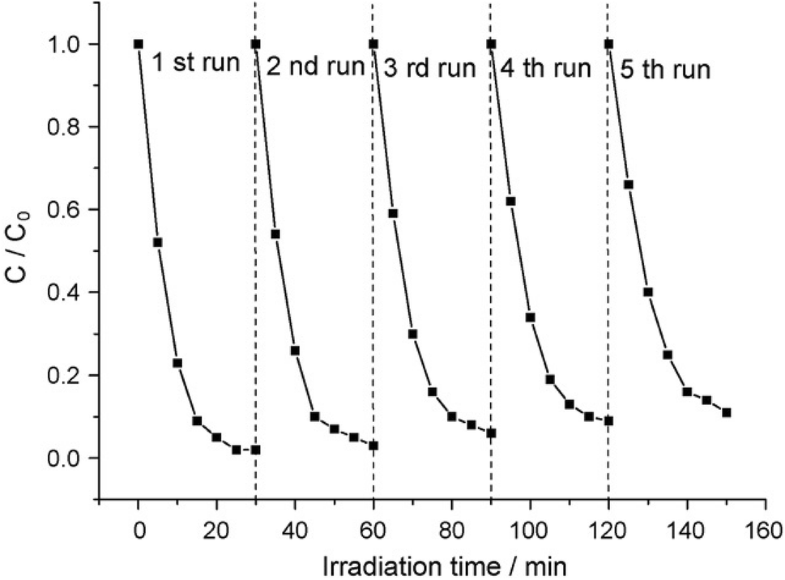 Figure 7 shows the change in absorption spectra in the photo-catalytic degradation of RhB as a function of irradiation time. From the figure, the concentration of RhB gradually decreases as the exposure time increases for all samples. It can also be seen the TiO2 nanoparticle capped with PVA exhibit higher percentage degradation of RhB than other samples. Using photocatalytic calculations, measporous TiO2 nanoparticle capped with PVA exhibit RhB degradation efficiency was 70% which were degraded subsequently at 120 min of irradiation time of ultraviolet light. The photocatalytic time scans of RhB illuminated at 502 nm with TiO2 nanoparticle capped with PVA are depicted in Fig. 8. This indicates that the crystalline structure, nanosized homogeneous granulometry and band gap is the important factor that affects the photocatalytic activity of the RhB. To study the stability of the TiO2 nanoparticle sample to carry out five times recycle for RhB photodegradation test, as shown in Fig. 9. After five recycles, the catalyst did not show any significant loss of activity, thus indicating that the TiO2 nanoparticle has outstanding stability. The chemical and physical reactions for the degradation mechanism of RhB dye with TiO2 nanoparticle under ultraviolet light irradiation shown below: Electron–hole pairs are generated on the synthesized metal oxide nanomaterial surfaces due to photoexcitation under visible light illumination [38, 39], as shown in Fig. 10. The mixed solution of RhB dye and photocatalyst is illuminated with ultraviolet light, the electrons in the lower valence band absorb energy and jump to the higher conduction band that had to the formation and development of positive hole and negative electron which move to the catalyst surface and act as active charge carriers . Now this free electron (e−) will react with an adsorbed oxygen molecules (O2) and forms oxygen radicals (·O2−). On the other hand, the holes (h+) of the valence band of TiO2 nanoparticle are taken by OH− derived from the aqueous solution and form hydroxyl radical (.OH) [41, 42, 43] in the mixed solution. As a result of this, radicals act as oxidizing agents. On the other hand, the reactive hydroxyl radical (.OH) can also be formed via the holes and OH− ions in aqueous solution. These radicals (·OH, O2 and h+) can participate in the photooxidation reaction [44, 45]. Influence of sonication and light illumination conditions, the RhB aqueous solution was decomposed into CO2, H2O and other small molecules due to the effective separation of photoexcited e+/hole [38, 44]. Various parameters such as particle size, phase composition, surface area and electron–hole recombination rate are to maximize the photocatalytic activity of synthesized samples. The recombination time of a free electron (e−) and the hole pairs (h+) is faster for commercial TiO2 samples. The fast recombination of free electron (e−) and the hole pairs (h+) slow down the degradation process. In the higher photo-degradation of the TiO2 nanoparticle capped with PVA (anatase phase) sample with a mixed dye solution, increase the density of free charge carriers by effective delay in the recombination time of photogenerated free electron (e−) and the hole pairs (h+) and decrease in band gap energy which improve the electron–hole recombination [46, 47]. Under the irradiation of TiO2 nanoparticle, additional charge carriers further react with superoxide species and prevent the electron–hole recombination, and thus relatively increase degradation efficiency. The probable photocatalytic reaction mechanism of TiO2 nanoparticle with an RhB dye molecule may be explained with the help of following equations. The potential UV light-driven photocatalyt of measporous TiO2 nanoparticles were synthesized by a sol–gel method for photodegradation of RhB dye. 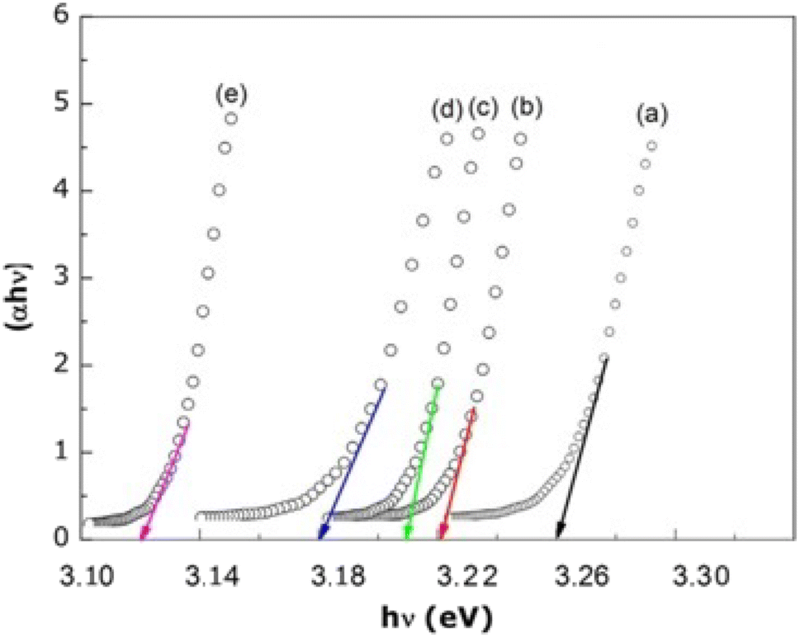 The UV–visible spectra showed that the band gap values of the photocatalyst decreased in the range 3.25–3.10 eV as capped with glucose, valine, EDA, EG and PVA. For rod-like TiO2 nanoparticles, the enhanced intensity of the PL band in blue and green emission rang results from the higher crystallinity, morphology, defects in surface gradually reduce the electron–hole recombination and consequently increase the photocatalytic degradation activity. The rod-like PVA capped measporous TiO2 nanoparticles demonstrated rapid and efficient RhB dye decomposition with a degradation rate of 70% within the initial 120 min, owing to the higher adsorption capacity and the better electron–hole pair separation under UV light leads to the generation of less harmless chemical.